While going down the Fall Preview post that Pearz created, this was the first anime that really caught my attention. I knew that I would watch it and, barring a complete team overhaul, I would love it. I absolutely loved the first season, after all. I watched the first season mostly on an extremely long train ride this summer while in China, so I don't know if that coloured my views in any way. 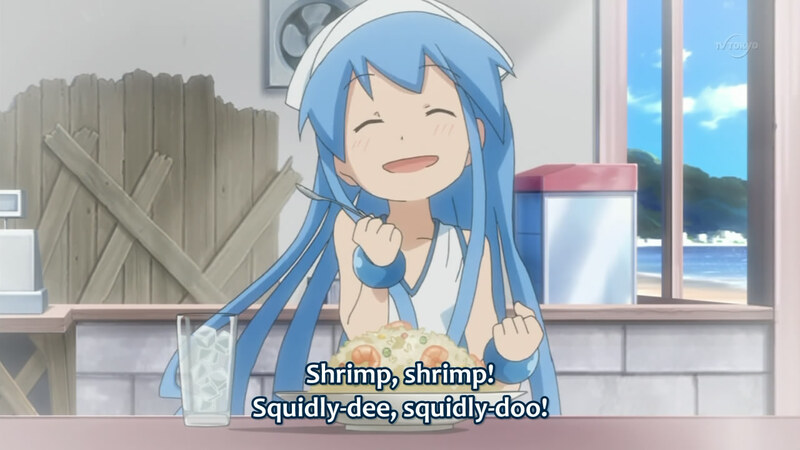 It was a great comedy show, full of insane happenings (kind of like Nichijou) and a ridiculous premise that Ika Musume (a squid girl) has come to the surface to take over the world. This first episode didn't disappoint; it retained the feel of the first season perfectly. I'm so jealous of her multi-tasking tentacles. As with the first series, this episode was broken into three parts. The first one, "Who's Up For A Squid-vasion!? 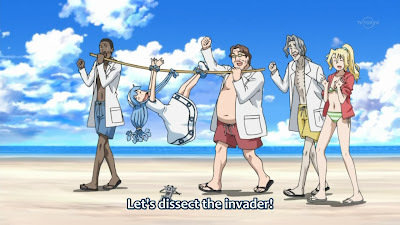 ", jumped right into the fray with Ika Musume watching an alien invasion movie and feeling sad for the invaders. Eiko chastised her to do some work around the house, and Ika Musume began explaining her sad fate of being overused by her heinous house-mates. Eiko wasn't about to fall for it, and reminded Ika Musume that, other than working at the shop and doing odd chores around the house, she pretty much just played video games and lazed around in the house. That tiny robot is pretty cute. I want. 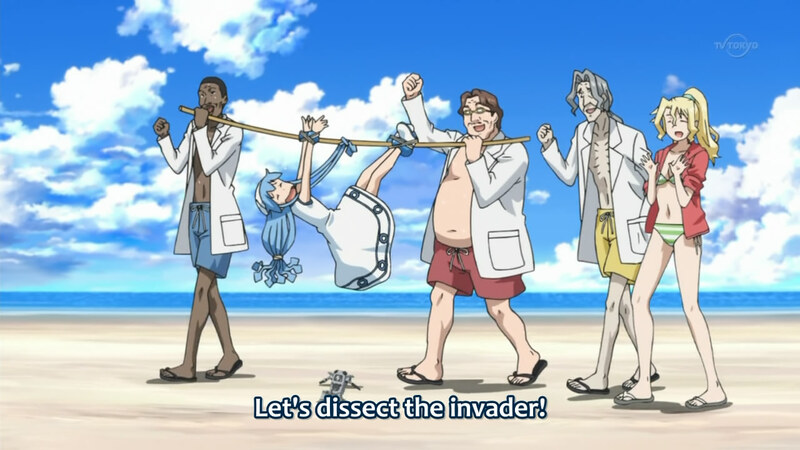 Ika Musume, saddened that her ideas of invasion weren't going so well, resorted to cleaning up the beach of litter. Being the first episode, most of the characters made an appearance in this first segment, beginning with Takeru. After throwing away his ball because she assumed it was a bomb, she ran into Cindy, who wanted an interview with her. 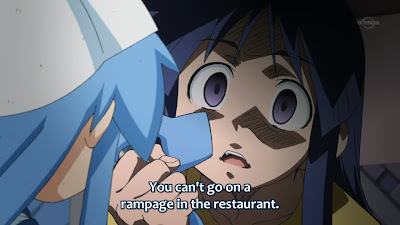 After destroying her recorder (which was apparently very expensive, given that Cindy hadn't paid it off yet), Ika Musume walked to the Lemon House, where she tackled Nagisa after thinking the oven timer was a bomb. 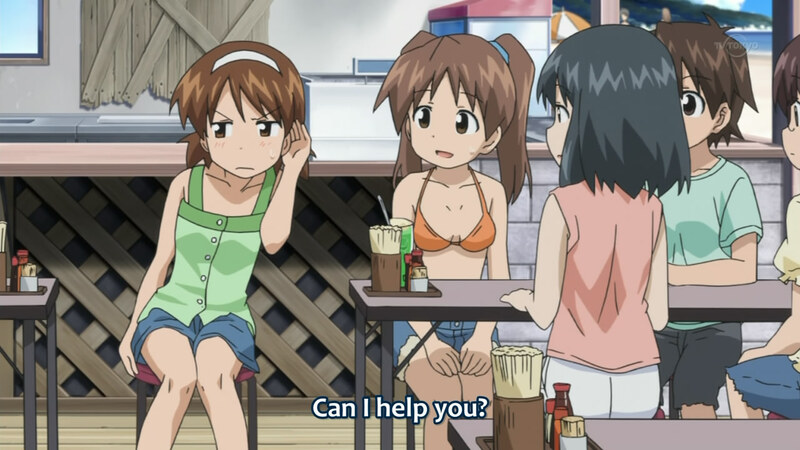 Leaving the beach house (where Nagisa was horrified and freaking out about coming into physical contact with Ika Musume), Sanae showed up for a split second. 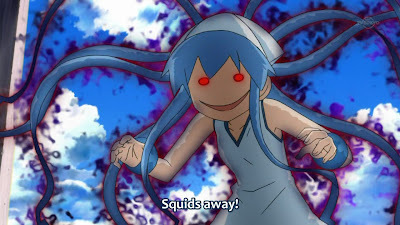 Knowing better, Ika Musume's only reason for running away was that Sanae was just 100% dangerous by nature. 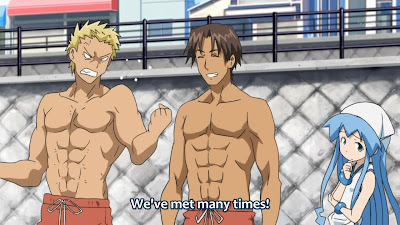 The last bit of introductions was Goro and his friend, Tatsuo. To be fair, I really don't recall this other lifeguard, making his indignation at not being recognized even funnier. 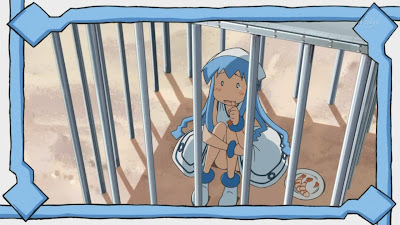 Running away from Goro's offer of free food - an attempt to impress Chizuru, but seen as an attempt to poison her - Ika Musume suddenly realized that, like a real invader, she had many people out to get her. Opening your eyes is always a pro move. 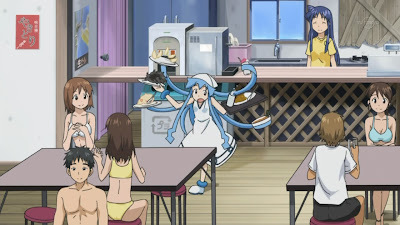 As with most of Ika Musume's revelations, it began to go wrong when she showed up at Lemon House as an invader, mirroring her first appearance back in the first season. She stole people's shrimp, sprayed ink all over the place (though Cindy and Sanae were quite pleased), and then began her real invasion, which involved jumping menacingly at the customers. However, as soon as it began, her wrath was dispelled by an annoyed Chizuru. 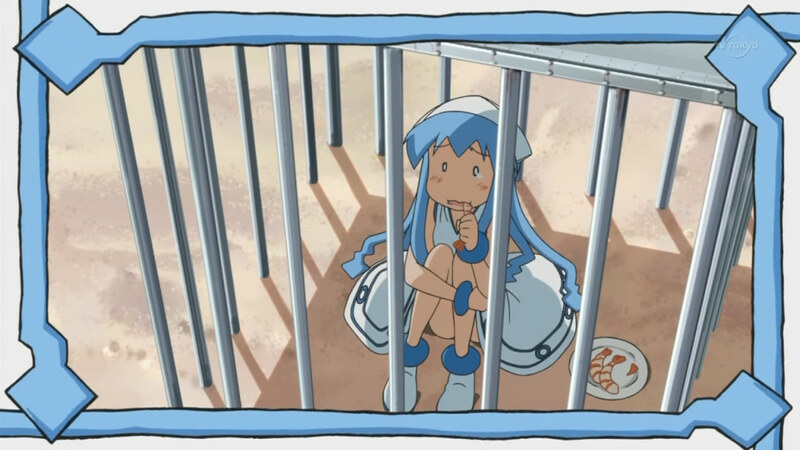 Ika Musume apologized earnestly, looking quite beaten up, and attempted to save face by calling an end to her current plan of her own free will. The second part, "Ink That's A Love Rival!? ", featured the reappearance of Kiyomi, Ika Musume's good friend. I remember the episode in the last season when she was introduced; I was so happy that, quirks and story aside, there was someone that genuinely liked Ika Musume! As expected, the arrival of Kiyomi to Lemon House caused Sanae to go crazy with jealousy, unable to understand why Ika Musume was acting so close with someone. I've actually always enjoyed the translations. The third and final part, "Making A Few Squid With Jellyfish!? ", was focused on the sudden onslaught of jellyfish. Not knowing the animal kingdom so well (other than Finding Nemo, I guess), I had no idea if there was more to the jellyfish-squid thing or not. 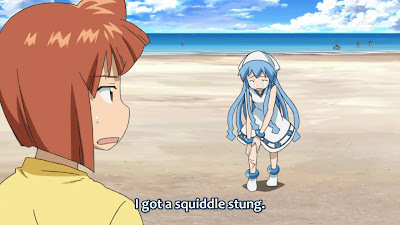 Anyway, Ika Musume attempted to first side with the jellyfish that were stinging the beach-goers, but getting stung led to her siding against them. I was actually surprised to see that the actual fight against jellyfish involved picking them out of the water and bagging them. Isn't it hard to not get stung? What happened to them afterwards? Money. It solves so much. 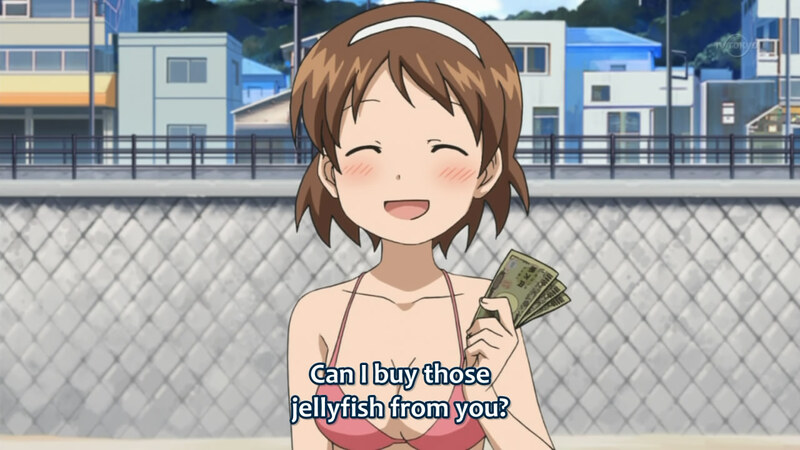 At Chizuru's suggestion, a Jellyfish Collection Competition was held in order to fully collect the jellyfish. Ika Musume's competitive side kept her from fully understanding her flaws - she kept bagging too many jellyfish into the same bag, rupturing the plastic and accidentally releasing all of them (and getting stung in the process). Cindy and her co-workers (Martin, Harris and Clark) ended up winning the competition...because they caught one and multiplied it. (Cloning?!) It wasn't really explained, but there's a good chance that the reason there were so many jellyfish around to begin with was actually their new toy. Ah, science. 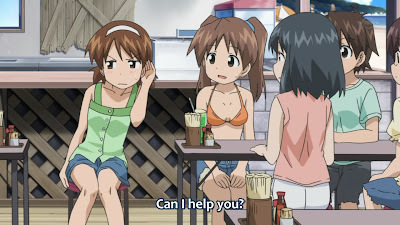 I always get so hungry after watching this anime. I'm glad to see that this episode was exactly like the ones from the previous season; given that I liked the last set so much, it's a treat. To be honest, it's not entirely necessary to watch the first season before picking this up. There's continuity such that characters return, but there isn't really much story-wise to "catch up" on. I remember the "climax" of last season very well, and there was nothing there that would have affected the upcoming episodes. This is just not that kind of anime. Watching it out of order (as in this season, and then the first one) is perfectly fine. There may be some discrepancies (such as how characters met), but nothing much. So she is capable of looking scary. 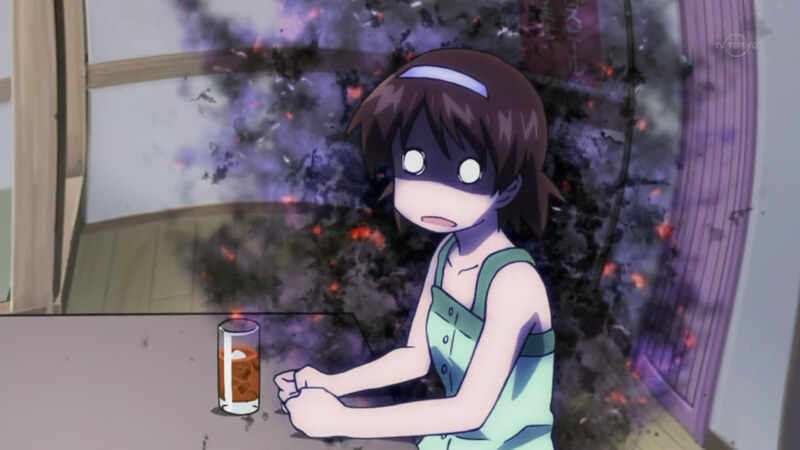 While I will be keeping up with this anime, more or less, I won't be posting about it. It's mostly a time issue - as in, I just don't have enough of it. Nonetheless, I'm still excited for this series for personal reasons.